Red River Real Estate and Vacation Rentals - Bearfoot Bungalow, Red River, New Mexico. Whispering Pines - ON THE RIVER! 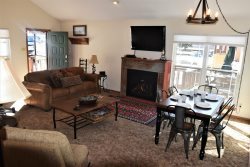 Very Nice Decor and Furnishings, Spacious Sleeping Loft, Upper Valley, Great Views, Satellite, Wi-Fi, Great Outdoor Deck! Two queen beds, one queen sleeper sofa, three twin beds. Walking distance from Main Street. Bearfoot Bungalow pet policy: Pets Friendly! Your website was set up well. The emailed communications were precisely what was needed to make me feel comfortable with the whole process. Your team members made me feel I was receiving more than I paid for. Bearfoot Bungalow was a perfect choice for our family. We only traveled with 5 people but it was big enough to easily accommodate the advertised 9 people. The property was as clean as the website photos showed it to be and the view from the balcony was spectacular! The amenities were everything we needed and we appreciated the short distance into town. We not only recommend Bearfoot Bungalow but we also want to ensure the staff understands how grateful we ere for the whole process. Thanks so much for making this part of our vacation so stress-free! Red River Real Estate does not provide wood specifically for fire pits. However, if your home has a wood burning fireplace, we provide a ration of wood(winter only). You can feel free to use this wood for fire pits! If you burn through the ration, you can buy more from our office.